Judi designs and sews blankets, girls dresses and skirts, and doll clothes on her current home island of Lanai, and the line also includes silkscreened shirts and onesies, all hand-screened on Maui by A Make Believe Company. Each of Judi’s hand-sewn items are boutique quality, with professionally serged seams, and made from 100% cotton designer prints. 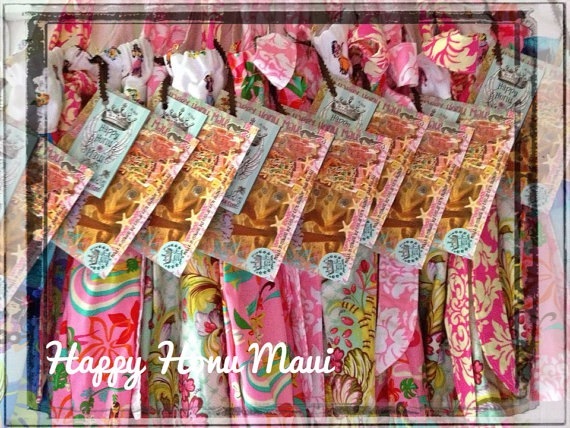 Judi offers a variety of girls’ dresses and skirts, blankets ranging from 13” x 13” jet set travel silky to the king kamehameha duvet cover, silkscreened shirts, dresses and onesies, plus some other fun items, all in her signature tropical style. Happy Honu designs can be found on Maui at Nuage Bleu in Paia, Designing Wahine in Makawao, Travaasa Hana, Hale Zen in Lahaina, and Proteas of Hawaii in Kula. On Oahu, they can be found at Aloha Aina Boutique and Boutiki, and on Lanai at the Island Gentry. She also has an online store set up on her website and an Etsy shop. Judi’s books, which she wrote and illustrated, can be found at Target, Barnes and Noble, ABC stores, all the island book stores and Amazon.com, in addition to all the state’s public libraries. “When I am Quiet on Maui” was featured in the 2006 and 2007 celebrity gift basket for the Maui Film Festival. It also found its way into the Maui County Time capsule — which will be opened in 100 years! “When I am Quiet on Oahu” was nominated for the prestigious 2006 Ka Palapala Po’okela Readers’ Choice Award, and on January 20, 2009, the O‘ahu book was featured in the Inaugural Ball Gift Basket for the Hawaii State Society in DC. Judi has also has a bunch of other fun goodies available on her website, like party penants, coffee cup sleeves (all created with her fun, tropical fabrics) and she’s also created these really cute postcards and posters!